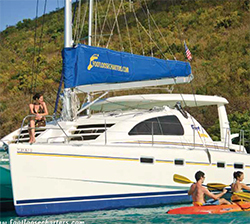 Footloose Sailing Charters is pleased to announce the addition of more of its most popular yacht, the Footloose 4600, a 4-cabin catamaran custom-built by Robertson & Caine, into its fleet. area for relaxation under sail, reading at anchor or just simply soaking up the sun. bathing platform, connecting the two transoms completes this exciting new model. In addition, Footloose is also proud to announce that it has expanded its fleet with more monohulls and catamarans of all sizes, from 32’ – 51’, so there is the right size boat for everyone.